www.rockproducts.com ROCK products • March 2019 • 31 next variable is the quality of the explosive. Any mine should have a quality control program for their explosive products, at minimum a storage at the mine of the explosive used during the blast for possibly testing down the road. This testing should not be done by the explosive distributor or supplied but by the mine or independent representatives of the mine, such as a chemical laboratory. With ANFO the main testing should be around oil content and with emul- sions the crystal count would be considered one of the important factors. After explosive quality is checked, what is next? Let's take a look at one of the simplest problems of blast toes, insuf- ficient subdrill. Subdrill The most common problem that causes sporadic toes and elevated floors after a blast is insufficient subdrill for one or more boreholes. To begin, it is important to understand that a subdrill increases the tension zone of the bench to the grade of the floor and an ideal subdrill for this is around 30 percent of the burden. 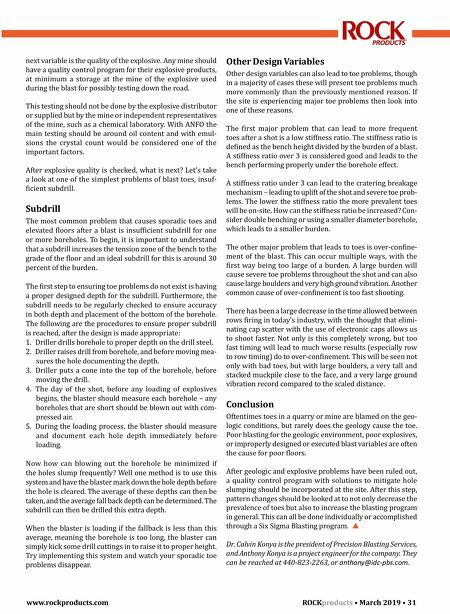 The first step to ensuring toe problems do not exist is having a proper designed depth for the subdrill. Furthermore, the subdrill needs to be regularly checked to ensure accuracy in both depth and placement of the bottom of the borehole. The following are the procedures to ensure proper subdrill is reached, after the design is made appropriate: 1. Driller drills borehole to proper depth on the drill steel. 2. Driller raises drill from borehole, and before moving mea- sures the hole documenting the depth. 3. Driller puts a cone into the top of the borehole, before moving the drill. 4. The day of the shot, before any loading of explosives begins, the blaster should measure each borehole – any boreholes that are short should be blown out with com- pressed air. 5. During the loading process, the blaster should measure and document each hole depth immediately before loading. Now how can blowing out the borehole be minimized if the holes slump frequently? Well one method is to use this system and have the blaster mark down the hole depth before the hole is cleared. The average of these depths can then be taken, and the average fall back depth can be determined. The subdrill can then be drilled this extra depth. When the blaster is loading if the fallback is less than this average, meaning the borehole is too long, the blaster can simply kick some drill cuttings in to raise it to proper height. Try implementing this system and watch your sporadic toe problems disappear. Other Design Variables Other design variables can also lead to toe problems, though in a majority of cases these will present toe problems much more commonly than the previously mentioned reason. If the site is experiencing major toe problems then look into one of these reasons. The first major problem that can lead to more frequent toes after a shot is a low stiffness ratio. The stiffness ratio is defined as the bench height divided by the burden of a blast. A stiffness ratio over 3 is considered good and leads to the bench performing properly under the borehole effect. A stiffness ratio under 3 can lead to the cratering breakage mechanism – leading to uplift of the shot and severe toe prob - lems. The lower the stiffness ratio the more prevalent toes will be on-site. How can the stiffness ratio be increased? Con- sider double benching or using a smaller diameter borehole, which leads to a smaller burden. The other major problem that leads to toes is over-confine- ment of the blast. This can occur multiple ways, with the first way being too large of a burden. A large burden will cause severe toe problems throughout the shot and can also cause large boulders and very high ground vibration. Another common cause of over-confinement is too fast shooting. There has been a large decrease in the time allowed between rows firing in today's industry, with the thought that elimi- nating cap scatter with the use of electronic caps allows us to shoot faster. Not only is this completely wrong, but too fast timing will lead to much worse results (especially row to row timing) do to over-confinement. This will be seen not only with bad toes, but with large boulders, a very tall and stacked muckpile close to the face, and a very large ground vibration record compared to the scaled distance. Conclusion Oftentimes toes in a quarry or mine are blamed on the geo- logic conditions, but rarely does the geology cause the toe. 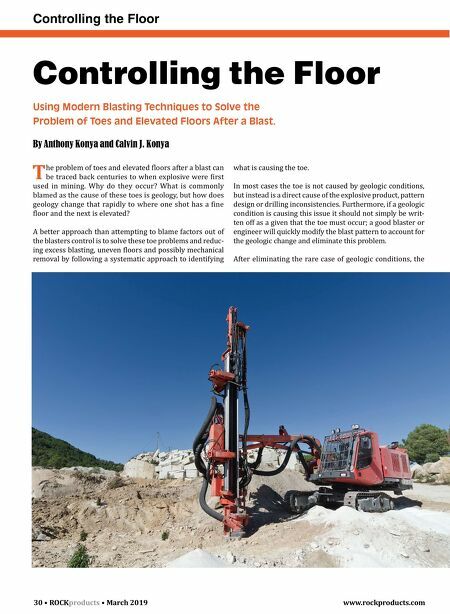 Poor blasting for the geologic environment, poor explosives, or improperly designed or executed blast variables are often the cause for poor floors. After geologic and explosive problems have been ruled out, a quality control program with solutions to mitigate hole slumping should be incorporated at the site. After this step, pattern changes should be looked at to not only decrease the prevalence of toes but also to increase the blasting program in general. This can all be done individually or accomplished through a Six Sigma Blasting program. Dr. Calvin Konya is the president of Precision Blasting Services, and Anthony Konya is a project engineer for the company. They can be reached at 440-823-2263, or anthony@idc-pbs.com.